Spin Master's Sonic Rocket launches up to 200 feet in the air. 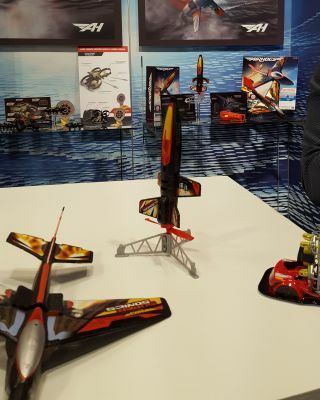 NEW YORK — The annual Toy Fair in New York delivers again, providing Space.com with a look at a dramatic motorized rocket recently released by Spin Master that can fly up to 200 feet (60 meters) in the air. The Air Hogs Sonic Rocket's aerodynamic foam body looks much like other toy rockets, but this toy has a twist: It uses an electric motor to launch the toy hundreds of feet into the air. Unlike stomp rockets, which use air pressure to launch into the sky, or toy rockets that are flung upward with force from rubber bands, the Sonic Rocket has a single propeller at its base that's let loose with a button press. Press it once and the rocket will launch 50 feet (15 m) into the air. Press it twice and it will fly up 100 feet (30 m) before falling back to the Earth. Three presses will launch the rocket an impressive 200 feet (60 m). A full charge provides up to 50 launches and hours of fun. Like a real spacecraft launch, the Sonic Rocket builds anticipation with a countdown before takeoff. It also twists itself around five times before blasting off. The toy fully charges in about 20 to 25 minutes, and each full charge promises 50 launches. So once the Sonic Rocket comes back down, it's immediately ready for another go, and then another and another for hours of outdoor fun. The Sonic Rocket is recommended for ages 8 and up. The full package comes with one rocket, made out of a sturdy, crash-resistant EPP foam a launchpad, an instruction guide and a USB cable for charging. The toy comes ready to fly: It doesn't require any assembly. Spin Master recommends the toy for ages 8 and up. The Sonic Rocket is available now and costs $19.99 on Toys 'R Us.